The first known record of the Company’s Coat of Arms is a sketched version on its Royal Charter of 9th November 1616 (see below) and as an emblem on the Company’s Seal. 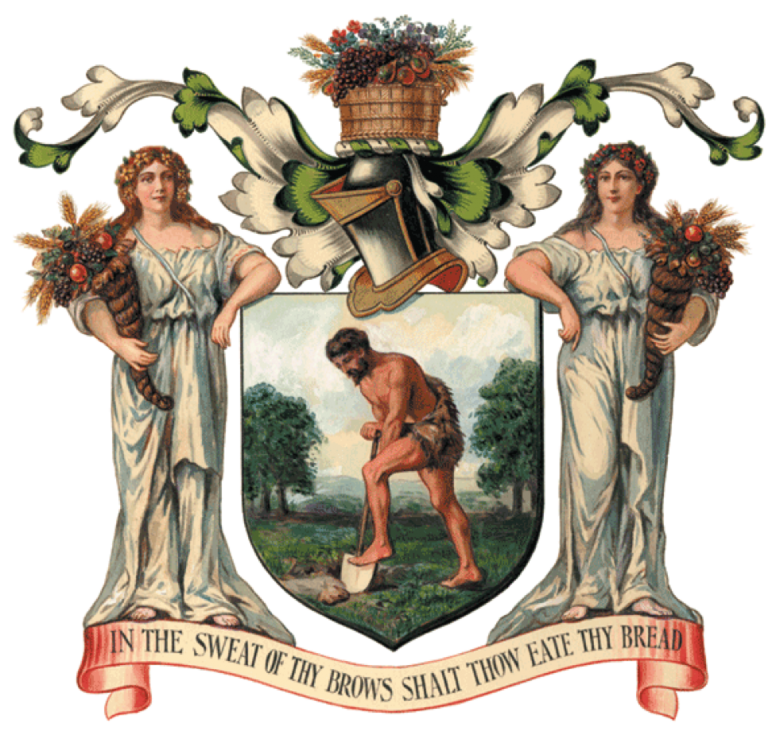 The central shield shows Adam delving in the ground with a spade and the motto below is a quotation from the section of Genesis where the Lord banishes Adam and Eve from the Garden of Eden. 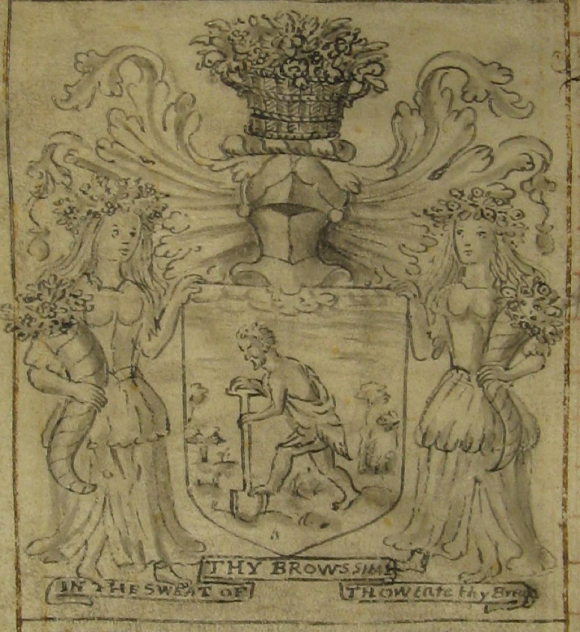 The female figures, known in heraldry as Supporters, are holding cornucopias of fruit and flowers, appropriate of course to the gardener's trade. Since then the Coat of Arms has appeared in a number of manifestations, two examples being below. 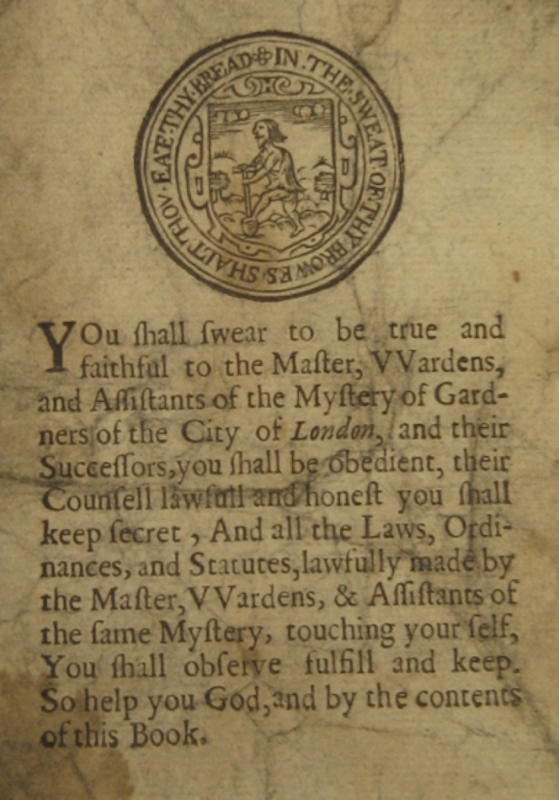 Here the Gardeners' seal, depicting on the central shield another version of Adam vigorously digging, is affixed to a copy of the oath taken by a Freeman on admission to the Company. It dates from about 1650 and, coming from the Commonwealth period, notably excludes a promise of loyalty to the Crown. Following the formal Grant of Arms by the College of Arms in 1905 the Gardeners' Company has used this version. The Company wanted its website logo to be far simpler and more modern than its Coat of Arms, but is pleased that the website logo has some relationship to this image in terms of both colour and theme.